We have been working more and more with the Google platform, and we think it offers a lot of positives for the ESU and for the schools that we serve. The collaboration feature is simply amazing. To be able to share a document, slide show, form, spreadsheet with others via a link or email address is phenomenal. 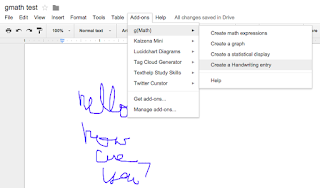 Google allows handwriting tools in a document. You would use the "Add-on" feature and find the "gMath" add-on. 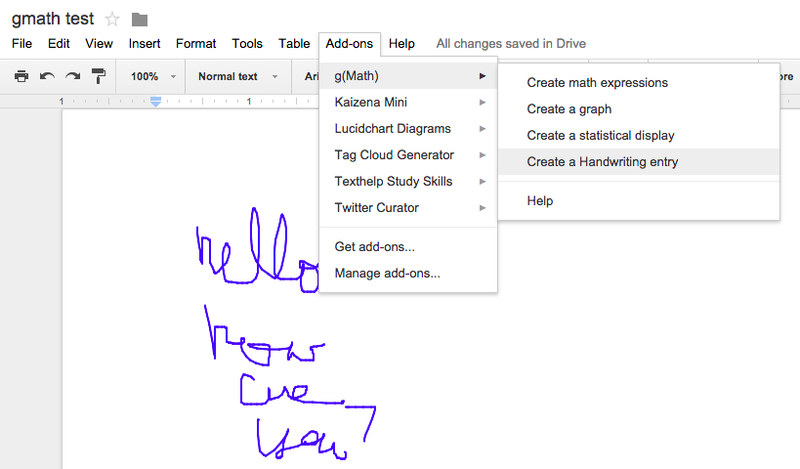 This allows you to create handwritten notes on a google document. And, for math nerds like me, I can create formulas in a google document or form. (see screen shot below) For more information on this tool, check out the detailed instructions here. Google Slides - just added new transitions. So, again, if working on a presentation and presenting with someone else, how easy to share that presentation with your co-presenters without having to send a separate attachment each time. Google Forms - we've been using this more and more. Use forms to catch data you want and need to end the year. Then, keep that data year after year for evaluation.